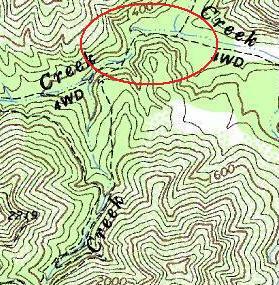 Along lower Manzana Creek in the Santa Barbara backcountry, a rib of sandstone known to some as Castle Rock (Jack’s Map) juts into the air along the west end of the wind swept ridge officially dubbed Hurricane Deck. This is not to be confused with another formation also known by a few as Castle Rock. Every time I have hiked through the area the north slope of the outcrop has caught my attention with its numerous caves seen from the trail. 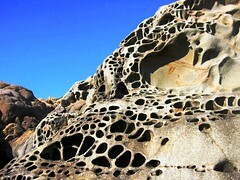 Yet, despite the lure of the rocks and my unending interest I had never explored the area. Recently I struck out midweek on an exploratory venture to change that. 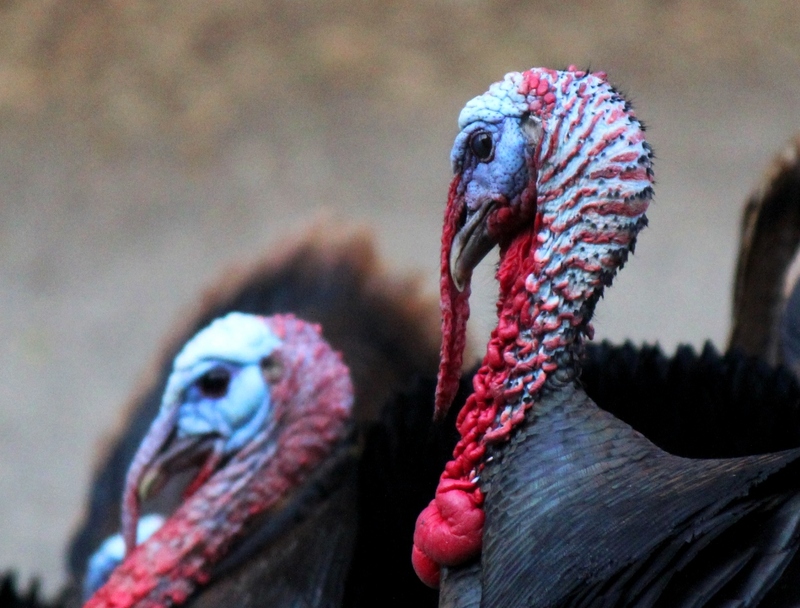 A rafter of turkeys seen along the flats of Alamo Pintado Creek. 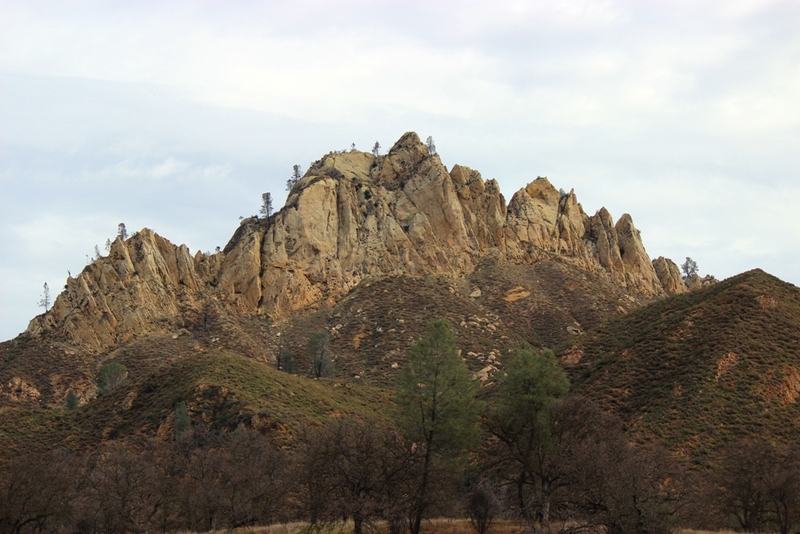 The Castle Rock sandstone formation in the San Rafael Wilderness, as seen in May 2011. 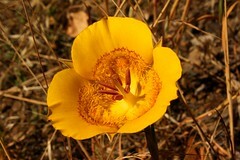 All other photos were taken at the time of this most recent hike. 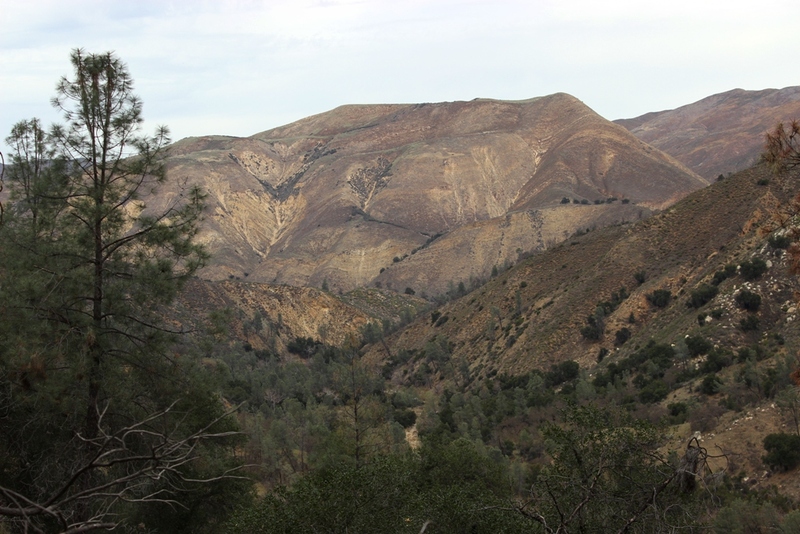 A cold wind howled over Figueroa Mountain and whooshed through the pine trees, as I cinched down the straps of my pack and headed down the Sulphur Springs trail from Cedros Saddle. An unsettling layer of dark clouds covered the sky and blotted out the sun. It was forecast to rain that night. After finding my way down the unkempt trail and reaching the confluence of Sulphur Creek and Dry Creek, I rounded a bend and surprised three doe grazing beside the creek. They promptly scattered into the forest crashing through bushes and over crispy dry leaves. Well there goes any chance of seeing more wildlife around here, I thought. I glanced up the mountain slope as I walked by and spotted one of the deer staring at me through the underbrush beneath the oak trees. I clicked my tongue against my front teeth like one might do when riding a horse and then yelled out, “I see you up there.” What happened next was a mite surprising considering all the ruckus. Walking on around the bend in the trail, noted on the left within the red circle, I came up behind a bobcat. It strode lazily along maybe thirty to forty yards in front of me. I stopped at first sight and watched it saunter on down the road oblivious to my presence. For a moment its behavior made me think it was a domestic cat. I couldn’t believe that it didn’t hear the crash of the three deer through the forest or the thud of my footsteps or if it did why it didn’t bolt. After a second more I quickly tore my pack off and set it down while watching the cat intently. It was still walking and clueless. Turning my sight to my pack I ripped my camera out as quietly as possible. When I looked up the animal was gone. I ran on my tip toes down the road, as close to the foot of the mountain it skirted as possible using it as a blind. There it was. Still in the road walking away from me. I knelt, camera to eye and poised ready to fire off shots as fast as my reaction made possible. The bobcat just kept walking. What is with this stupid thing? I thought. I held fire for fear that the rapid shutter clicking would scare the cat into the forest in a blur. 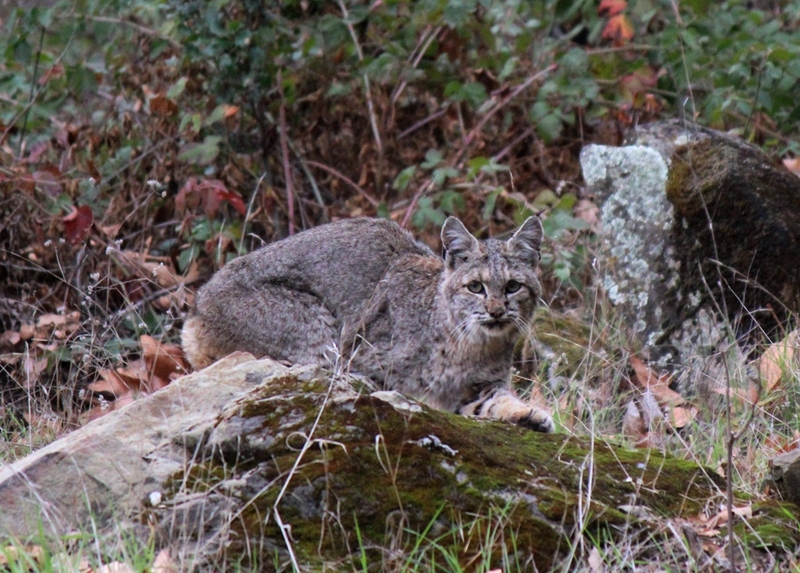 The bobcat wandered off the road and up on top of a small boulder buried in the ground, where it proceeded to sniff around, its head out of sight and its rear end pointed skyward. Crouched in plain sight I waited, concluding that these animals were far less crafty and perceptive than I had grown to believe. It finally raised its head and began to turn my direction. Upon spotting me it froze dead still. I let rip with the camera and we glared at each through the lens for a few seconds, the shutter flapping away. After a riffle of shots I pulled the lens from eye to make sure I had my settings right and was actually getting worthwhile photos. The second I turned my head down to view the camera I heard a crash through the underbrush and the animal was gone for good. I turned and headed down canyon shaking a fist in the air knowing that whatever else was in store for the afternoon, my day was already made. 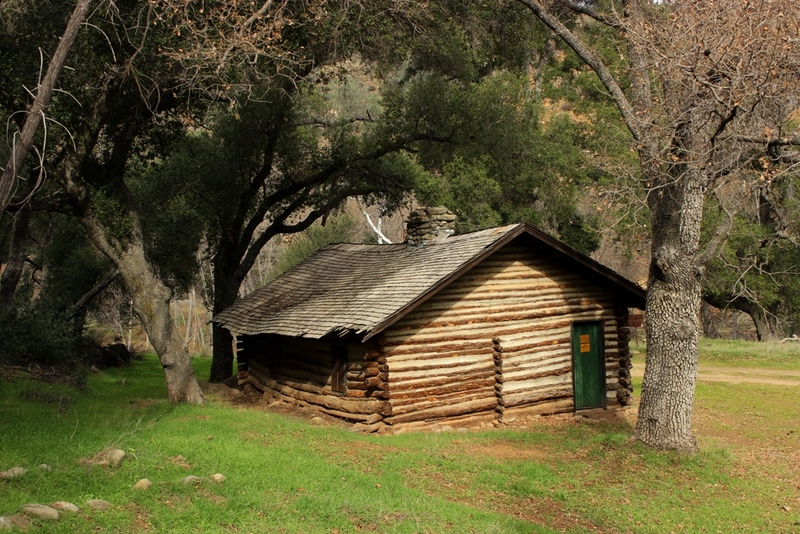 Dabney Cabin beside Manzana Creek was originally built in 1913 or 1914 depending on the source consulted. It was constructed as a recreational lodge for Charles William Dabney and today stands as Santa Barbara Historical Marker No. 8. The southwest face of Castle Rock. The northern face of Castle Rock showing the green of winter ferns and moss. 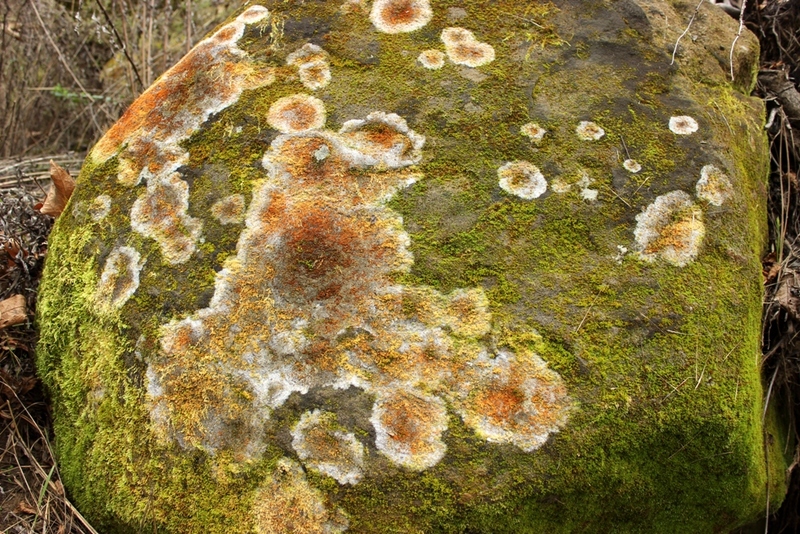 A moss and lichen covered boulder seen at the foot of Castle Rock’s northern side. The cave that was my main destination for the day. It appears here deceptively easy to get into. Having reached Castle Rock, I picked my way up the rocky chute that drains its north face in wet weather. Scrambling up the declivity, and out of the dry creek, I headed for one of the larger caves that is visible from across Manzana Creek on the trail below. 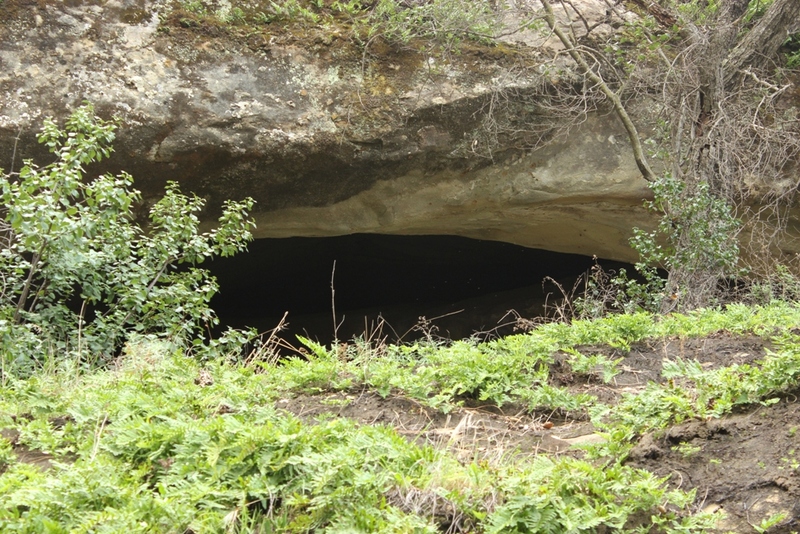 The cave shown above. It was readily apparent that the peak was steeper and more treacherous than I had anticipated, and that climbing it was not going to be easy. 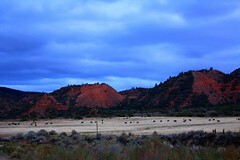 For the most part only a thin layer of soil covers the steep sandstone. As I pushed my toes into the grass to climb, the dirt peeled free from the stone in a mat held together by roots and I promptly went sliding downhill. Okay, time for the next option. I gained traction in a crack kept clear and bare by rushing water in rainstorms and slithered up it and through the branches of a downed pine tree. 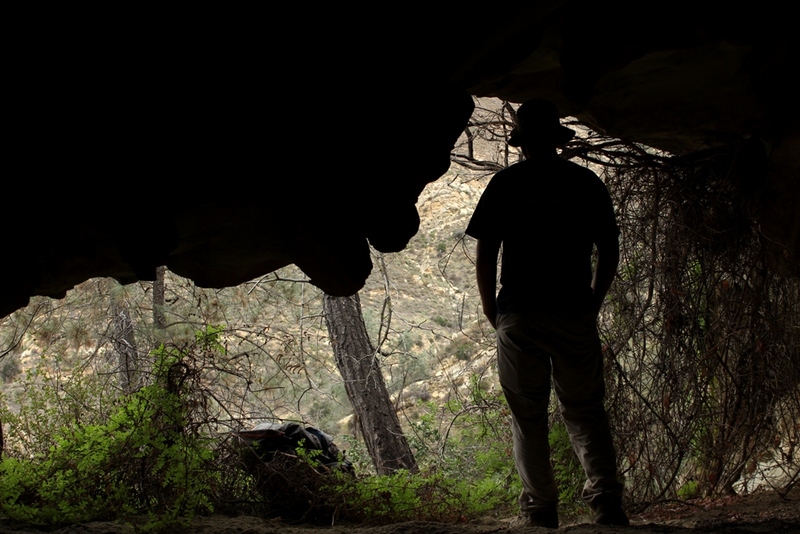 Once I reached the cave I found it impossible to gain entry despite being mere feet from its entrance. Perhaps somebody with more courage or fewer brains might make it inside. But I was alone, and without a satellite phone this time around, and so could not risk a debilitating fall. Grudgingly, I admitted defeat and turned my attention elsewhere. The cave I could not get into as seen from above. Maybe one day I’ll return with a rope and make it inside. 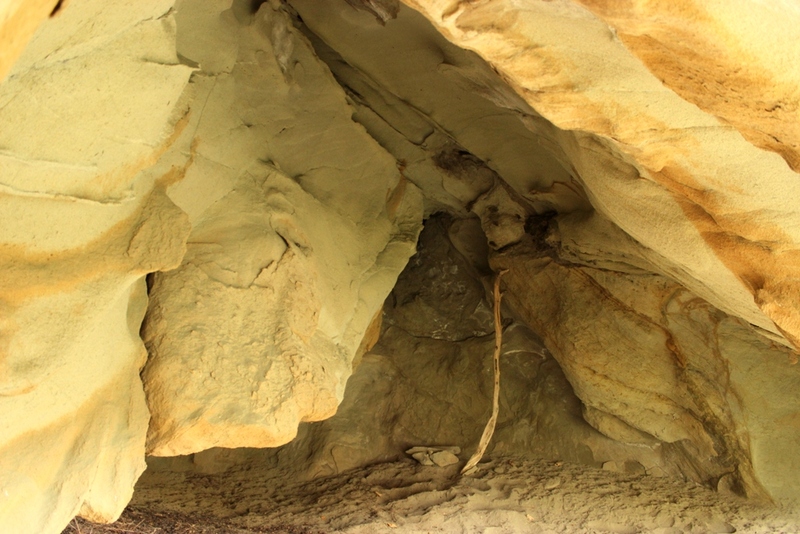 The outward appearance of a different cave, which is easily accessible. 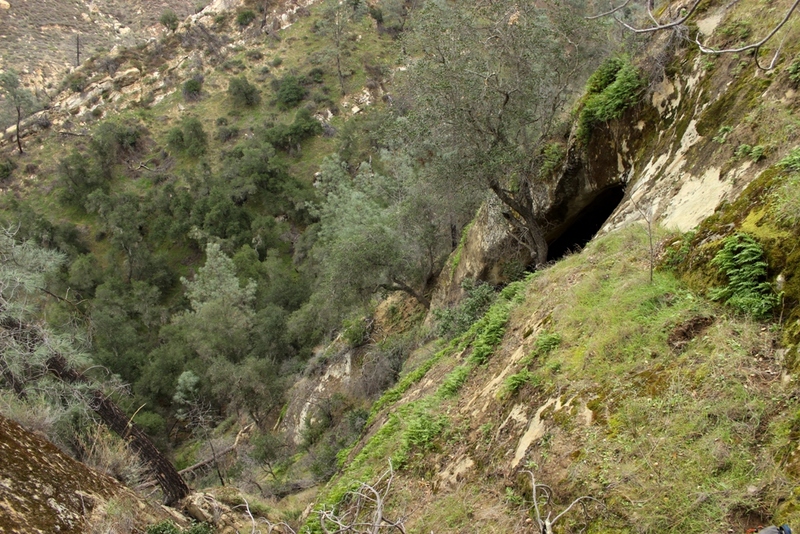 Making my way further up the slope another cave came into view, its mouth hidden behind a shroud of bare poison oak branches. 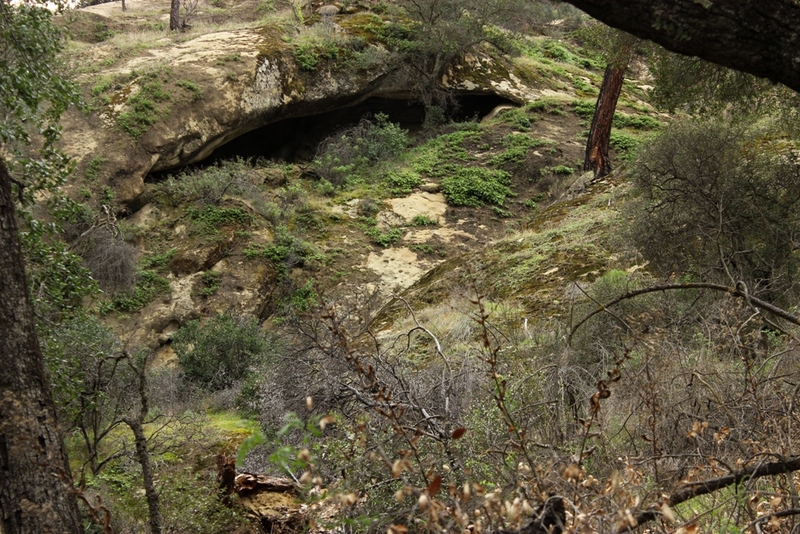 When the poison oak is fully leafed out in summer the cave must be unnoticeable from a distance. As I parted the branches and stepped inside I was surprised to see its size. I couldn’t help but admire what a choice campsite it would make and pondered what I would do to turn it into a cozy dwelling. 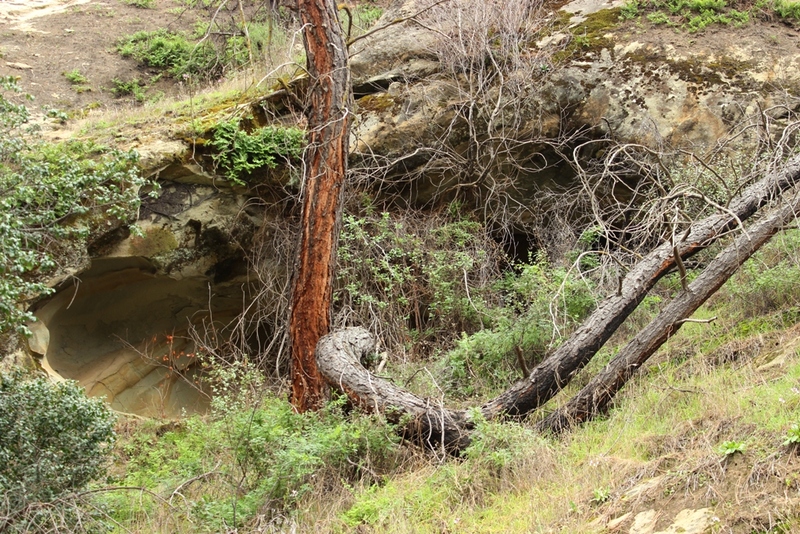 Standing in the mouth of the cave looking over lower Manzana Creek. 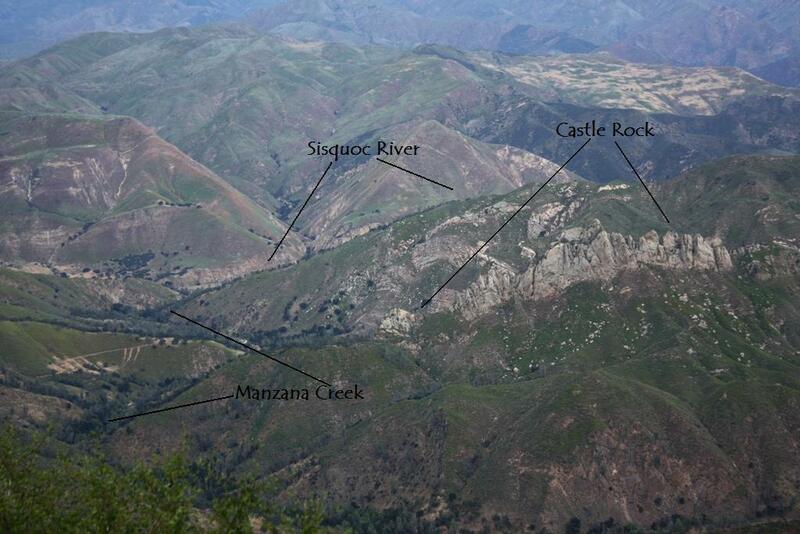 The view from the cave looking over Manzana Creek and toward the Sisquoc River confluence. 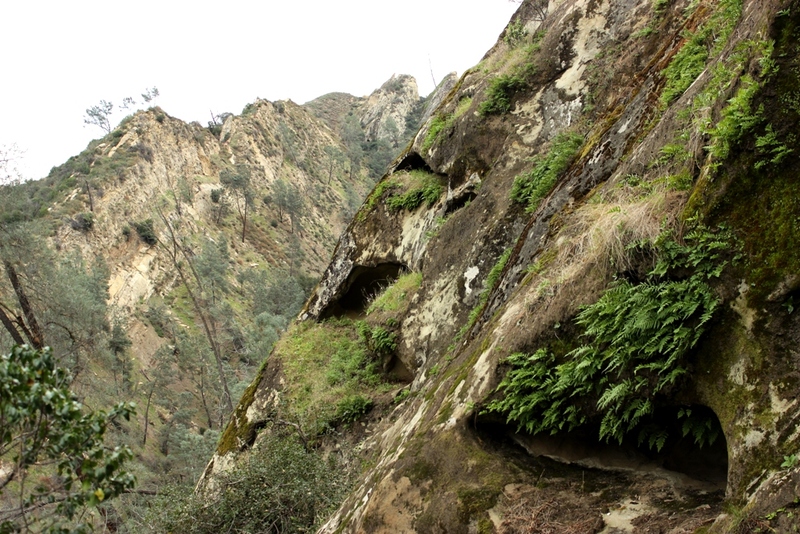 A view showing the steepness of Castle Rock’s northern slope and some of its smaller caves. After a rest I left the cave and climbed to the top of the outcrop along its lower most saddle and then scampered on back down the slope to the canyon floor. 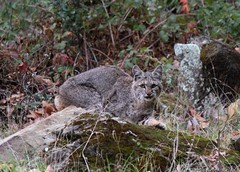 Walking back up Sulphur Creek toward the trailhead, I crossed paths with another smaller bobcat. I had mistakenly walked off the faint path and been pushing through the bushes when I spotted the cat a short distance away. Yet again, I could not believe it had remained so close. It had seen me, but was walking slowly away seemingly unconcerned. 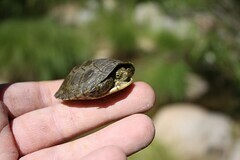 It didn’t dart off, but just wandered away into the woods as I fumbled with my camera in vain trying to get a shot off. 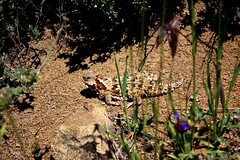 Finishing up the last section of the trail before reaching my ride, I thought back on an decent day for seeing wildlife. You just never know what you might find out there. 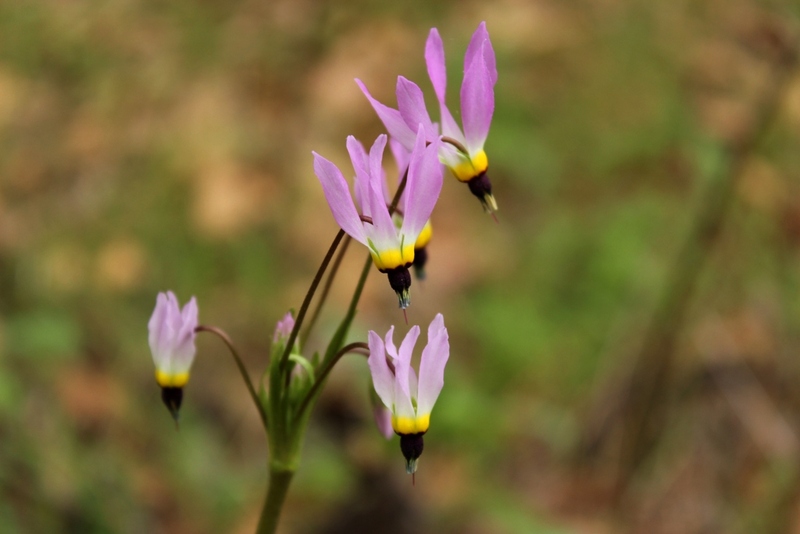 This entry was posted in Santa Barbara County and tagged Adventure, Animals, backcountry, Birds, Bobcats, Caves, Hikes, Hiking, Landscape, Mountains, Nature, Photos, Pics, San Rafael Wilderness, Turkeys, Wilderness, Wildlife, Writing. Bookmark the permalink. GREAT post. Thank you so much! 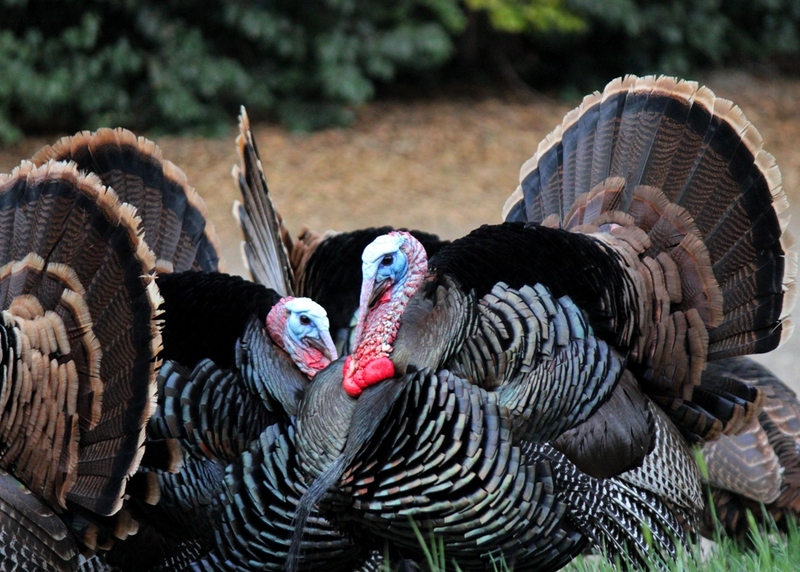 The turkey and bobcat photos are wonderful. Thanks for stopping by; glad you liked it. I’ve come across two bobcats in my life and neither seemed to be in much of a hurry to leave the trail- odd. Was there much water in the Manzana? I’m thinking of heading there with the kid this weekend. There is plenty of water in Manzana, though, relatively speaking considering it’s winter and the rainy season, it’s low. The turkeys out that way are a trip. A couple of years back I did a quick overnighter to the Schoolhouse. 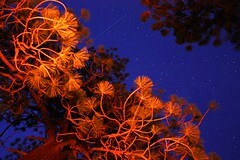 Around twilight, I started a walk back up the road bed towards Dabney Cabin with the pup just to stretch the legs. Up ahead we could hear something making a bit of noise in the brush. I thought for sure it was going to be a couple of deer or maybe a bobcat, instead we flushed out a group of about 6 turkey, all big ones! 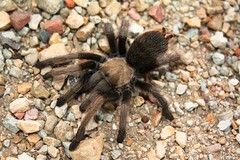 One especially was huge, easily twice the size of the others; he looked like a small ostrich! As soon as they saw us, they beat it back up the hillside and into the bush. The rest of the night, we could hear their calls off in the distance. Thanks, Nico. 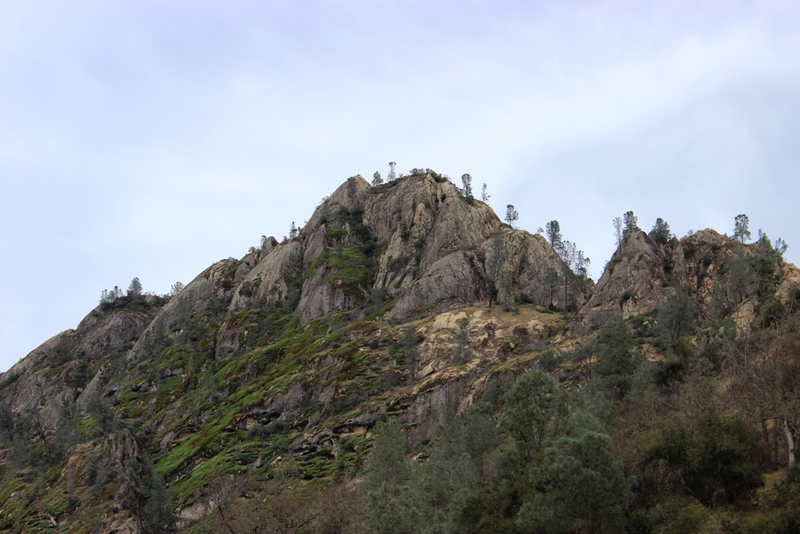 I recall somebody posting links on SB hikes to some photo sets of the county, might of been that same gentleman, but I had not seen those photos of Castle Rock. What a fantastic adventure and a bobcat as a bonus ! Awesome stuff !! Great stuff, I’ve often thought of visiting those caves and that little side drainage. My own experience with bobcat and other animals suggests that they’d rather not spend energy darting off unless they have to and so as long the actions we’re taking are mellow and not perceived as threatening the animals will often just continue what they’re doing. I’m with you it’s hard to tell if a bobcat has actually noticed me or not in those situations, I’d like to think I’m stealthy and they didn’t, but I’ve also noticed that house cats out in the yard will often ignore people around them and focus on what their doing until something shifts, and usually what shifts is the intensity of our own energy being focused on them and so the trick is to try to remain as cool as a cat for as long as possible. Hey James. Yeah, that makes sense. 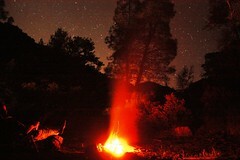 I just stumbled across your site and it’s good to see others sharing our interest for similar adventures off the beaten path in the Santa Barbara backcountry. Nico already posted the link to our “Rok Ramblings” index of adventures above and you will note several albums in the Lower Manzana and Zaca sections where we spent some time trying to crack the defenses of Castle Rock. Time and again we were defeated by complex topography and treacherous rock walls coated by sand, dirt and moss. We finally learned the summit is best reached by the western ridge but got distracted by other projects and never returned with permission to cross private land and complete our quest.